Over winter break when the kids were home from school and as we prepped for the holidays it was so cozy and nice. I pulled out my knitting needles and started a project. 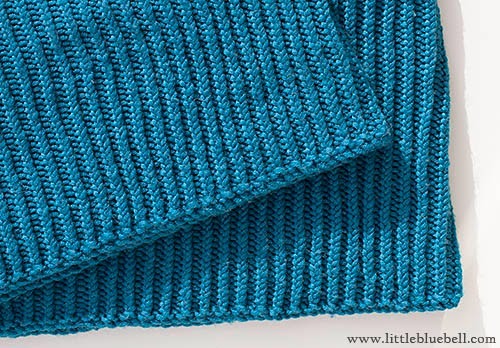 I started making a swatch of herringbone stitch with plans to make the herringbone cowl from the Purl Bee, but my hands cramped up after just a few rows. It had been so long since I've knit anything. Maybe I needed a warm up project. I liked the idea of making a cowl so I cast on a bunch of stitches and joined them in a round. Then I knit and purled my way through two balls of wool. The calm repetitive motion was so soothing in the evenings especially at the end of a busy day. Does the term "a bunch" alarm you? It should. Keep reading. 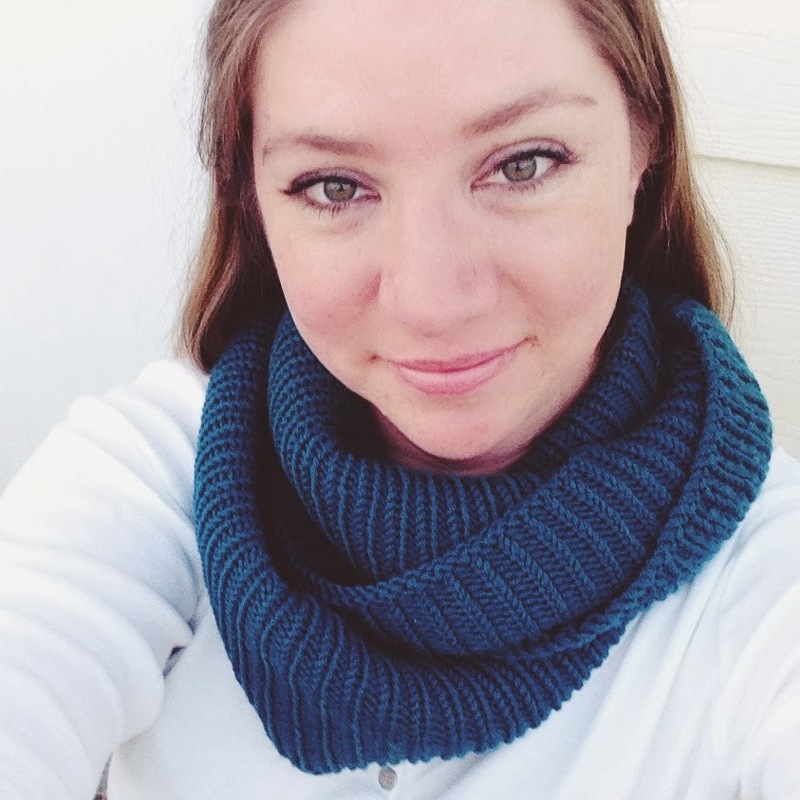 After binding off the very last row I had the satisfied feeling of a finished project and promptly looped my project over my head and looked in the mirror. It was awful. I laughed and laughed and I told my husband I looked like I had been in a car wreck and needed a neck brace. Maybe I should have done a gauge test before spending days knitting a circular object that was too small. Before tossing it aside, I tried blocking it with the steam from my iron. That helped relax the fibers and the stitches and made it wearable. Phew! When I looked closer at the stitches they didn't look quite right. I think it's because I cast on an odd number of stitches in the round and then used an even stitch pattern (k1, p1). Anyway, I got this funky stitch variation on one side and the rows slant ever so slightly. 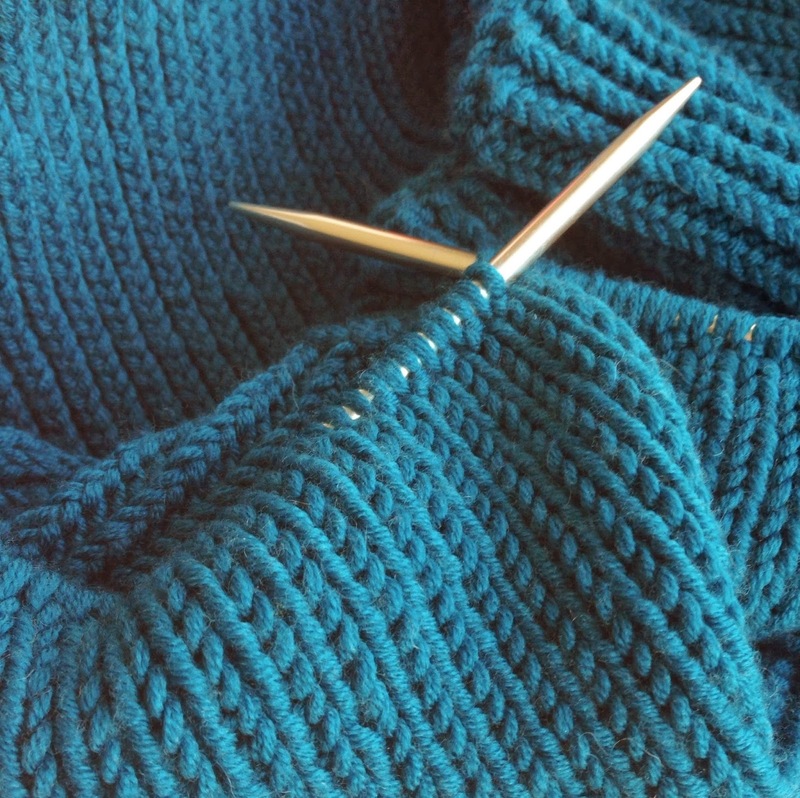 It doesn't bother me too much, unless a knitting ninja wants a closer look. Then I feel kind of silly. Oh well, there is always next time. So here is my finished project. I'm calling it the Warm Up Cowl. The color is gorgeous. I used two balls of Cascade Longwood yarn in Deep Ocean which I bought locally at SueDee's. I really liked knitting on these cold winter nights so I think I need another project. Up next might be the Honey Cowl by Madelinetosh. Hosta Blue from their Spring '14 collection is so pretty. it's odd that it would bias since it's a multi-plied yarn. it kind of looks like you might be twisting your stitches. that could make the piece bias. good for you for persevering. that much 1x1 ribbing would make me cry from boredom. Beautiful color. I have "invented" my own pattern on the last two knitted projects. With one of them I like "my" pattern even better than the correct one. Beautiful work, Adrianne. I hope you don't mind, but I borrowed your top photo for my blog post at Tracings, and I linked it back to your post. I don't know if it will send any traffic your way, but I wanted to let you know in case it does.